The town of Newtown, Connecticut had their eye on a critical piece of property known as Halfway River. These twelve acres of land, including 1,200 feet of frontage along the Halfway River provide space for low-impact recreation and valuable access to one of the state's best wild brown trout fisheries. 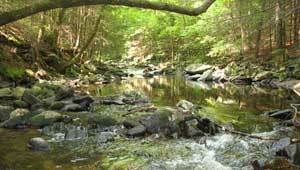 When the land went up for sale in 2008, Newtown asked for The Trust for Public Land's help to permanently safeguard the streamside habitat and high water quality that support the renowned fish population. TPL purchased the property and held it until the town could assemble its own funding, which it expected to - and did - receive from a settlement with General Electric for damages to the Housatonic River. The acquisition was completed in March 2009.